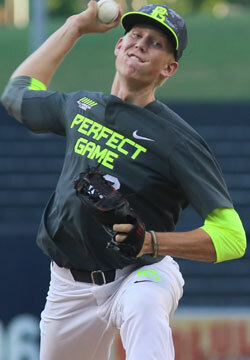 Zeferjahn is a late rising prospect who hadn't been seen by the national scouting community before the Perfect Game National Showcase in mid-June. He has a prototype young pitcher's build that really projects to get stronger over the next few years and a loose and fast arm action. Zeferjahn pitches in the low-90s with his fastball and has touched 95 mph frequently. His breaking ball is an upper-70s slurve with tight spin and good depth.